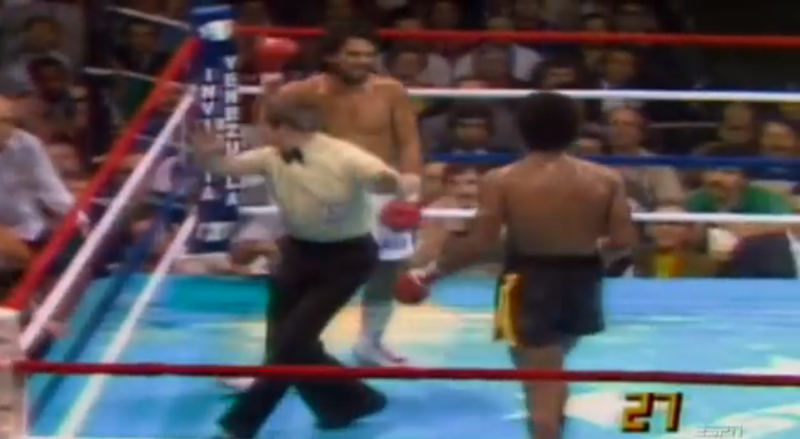 Roberto Duran stunned boxing fans when he put a beating on then welterweight champion Sugar Ray Leonard in their first meeting, "The Brawl in Montreal," June 20, 1980. But that was nothing compared to the shock he provided in their second meeting five months later. In the eighth round, after exchanging a few blows with Leonard, Duran traded hooks and jabs for a move that most in boxing had never seen before: he waved his right glove in surrender. "No mas," he said. No more. One of the most ferocious fighters the sport had ever seen — Joe Frazier said Duran reminded him of Charles Manson — up and quit. The crowd at the Superdome in New Orleans and those watching live on TVs around the world were flabbergasted. From his ringside microphone, legendary broadcaster Howard Cosell summed it up as it unfolded, calling it "the most inexplicable thing I have ever seen in the ring." The "No Mas" fight transcended sports and instantly became part of the pop culture. (You didn't need to be able to pick Roberto Duran out of a lineup in order to understand a "no mas" joke.) The TV footage was boxing's version of the Zapruder film, with the outcome unmistakable and the cause shrouded in mystery. Why did Duran quit? Did he have stomach cramps, as he insisted after the fight but showed no signs of up until his surrender? Was he out of shape? Had he simply had enough of Leonard's showboating antics? These questions have never been satisfactorily answered. And for all of these reasons, the "No Mas" fight is perfect fodder for ESPN Films' "30 for 30" franchise. But like many boxing bouts, No Mas fails to live up to its self-created hype. Credit where it's due: director Eric Drath has created a solid retrospective that convincingly contrasts Leonard's golden-boy charisma with Duran's dark-eyed intensity while capably guiding us through all the pre-fight hype, the in-ring battles and the post-fight fallout. He also gets Leonard to do what few elite athletes ever will: admit pain and fear. (Leonard says at one point that the punishment dished out to him in his first matchup with Duran made him feel "close to death.") These aren't small things, and No Mas is consistently entertaining as it looks back into the past. Alas, Drath missteps by trying to recreate that long-ago conflict in the here and now, structuring his documentary around a trip by Leonard to confront Duran in his native Panama that never feels like anything other than what it is: a made-for-TV gimmick constructed by the filmmaker to artificially sweeten the drama. Not surprisingly, that subplot leads nowhere. When Leonard and Duran literally step into a ring to have their verbal showdown (a goofy concept straight out of reality TV), Leonard doesn't care enough to rough up Duran until he draws blood, and Duran simply falls back on his old excuses without even needing to fully articulate those excuses for the record. As verbal confrontations go, it's less a heavyweight bout a la 2013's unforgettable Winfrey-Armstrong and more like a slap-fight you'd find on an elementary school playground — or on Twitter. In effect, both men throw up their hands and say "no mas" to "No Mas," and we shouldn't be surprised. People nearer to the end of their public lives are just likely (and perhaps more so) to be interested in protecting their reputations as they were in their youth, even though journalists of all stripes repeatedly romanticize the notion that personal revelations are somehow progressive, with the truth always coming out in the end. Buying into that myth in the first place is mistake enough, but Drath makes another common mistake by falling in love with his original idea, because when the Leonard-Duran conversation resulted in little more than awkward patter, Drath would have been better off cutting the subplot from his film entirely. In the least, he should have recognized that the most significant moment in that exchange seems to be one that he relegates to the closing credits, when Duran wonders aloud why Leonard wouldn't grant him a third fight just a few months after the "No Mas" bout. Leonard's stuttering response could be interpreted as revealing: "It was psychological--- it was psychological warfare," he says, insisting he was trying to get into Duran's head and sounding very much like a guy who always had Duran in his. Of course, to confront Leonard's avoidance of an immediate rematch would mean confronting Leonard, who Drath mostly treats with kid gloves. It also would have meant being more forthright about the place of "No Mas" within Duran's entire career. Because while Duran suggested he was going to give up the sport after that 1980 fight, he didn't. Far from it. According to statistics provided at the end of the film, Duran appeared in 12 more title matches across three weight classes and won three more titles. As KO Magazine editor in chief Steve Farhood puts it, "(Duran) did enough to prove that ('No Mas') was an aberration. That wasn't the real Roberto Duran, and we think of him as one of the greatest 10 fighters in boxing history. 'No Mas' didn't take that away." Unfortunately, No Mas almost does. Drath spends more than 70 minutes making Duran look like a one-hit wonder, a jerk who turned into a coward. Then he spends three minutes trying to give Duran the respect his career demands. That's not to say that Duran doesn't deserve scrutiny (his excuses have been inconsistent and unconvincing), or to suggest that the "No Mas" fight isn't worthy of a narrow focus (it's one of the most famous fights in boxing history, with good reason). Still, it's hard to imagine Duran's subsequent redemption being downgraded to a footnote if he had been the American fighter with the golden boy image. Boxing loves villains, and Duran made for a great one, but the value of looking back with hindsight is the chance to see him as more than his 1980 reputation, to look at these events anew within a larger context. With fresh perspective, Drath might have unearthed an epic tale of a boxer who had little personal fortune, then became an overnight celebrity by beating Leonard, then swiftly fell in love with the spoils of star status and lost his commitment to greatness, only to become an overnight villain when he surrendered in Leonard's rematch, only to slowly but steadily rebuild his career and restore his reputation. As it happens, one of Drath's talking heads essentially tries to point the director in that direction. "As horrible as ('No Mas') was for his image at the time," Farhood says, "it gave (Duran) the opportunity for redemption. And there's no greater story in boxing than the story of redemption." Alas, at that point in Drath's documentary the closing credits are just three minutes away, leaving that greater story to be told by someone else. I fell off pace with the "30 for 30" series in 2013, but I hope to do better moving forward. Here the ones I have reviewed. Wonderful! This is one of the first of these that I'm really tempted to go watch (unfortunately I've lost a lot of interest in pro sports), having had a few amateur fights myself and having discovered and taken up the sport in my 30's.